Traditional biscuit with Irish butter and sugar grains. 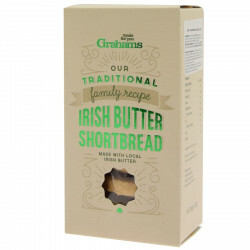 Irresistible biscuits made with 21% Irish butter and covered with mouth-watering sugar grains. Gourmet, this shortbread round shape is slightly crisp and sandblasted. Traditional methods and innovative ideas are the favorite ingredients of the Graham family. Since 1956 in Dromore, south of Belfast, grandparents, parents and grandchildren of the Graham family follow one another to create recipes inspired by the Irish tradition! Made with Irish butter, Graham cookies and shortbreads are refined and of very good quality. A true delight to the Irish! Ingredients: fortified wheat flour (wheat, calcium carbonate, iron, thiamine, niacin), butter (milk) (21%), sugar, maize starch, palm oil, rapeseed oil. For allergens please see ingredients in bold. May contain traces of nuts, sulphites and soya. No artificial colours or flavouringd added. Best before : see end of pack. Store in a cool, dry place. Once opened, enjoy within 3 days.